No, it wasn't stolen, but it's not in Detroit at the NAIAS where you would expect it either. For thousands of expectant fans, the absence of the Porsche 918 RSR came as a cruel surprise this weekend when the show was finally opened to the public after a week of reporting and accolades from the automotive press. Imagine driving to Detroit hundreds, if not thousands, of miles just to see this future icon only to find a gaping hole where the 918 once stood. Where did the Porsche 918 RSR go? Thank you for posting this. My 13 yr old son and I had planned to drive to Detroit (from VIRGINIA) this coming weekend specifically to see this car. Bummer, but glad we found out now. Hope the boys in Qatar enjoy the car. They’re more likely to afford it than me anyway. Bill, please check back with the show later in the week. You never know, the outcry might be enough to bring it back. Doubtful, but you never know… If you haven’t done so already, we have lots of pics on our Facebook page. Not the same as being there, but it’s something. I am absolutely furious with Porsche. My friend and I drove 250 miles, paid $250 each and put on a tuxedo to attend the black tie charity event on friday night only to discover the car we came to see was gone! The Porsche spokeswoman was smug, emotionless and offered no help or explanation. I feel betrayed by the company I have supported so strongly over the years. Porsche couldn’t keep the car at the show one weekend? This is an outrage. I attended NAIAS last Thursday (an industry day prior to the public opening) and the car was already gone. I share everyone’s disappointment, it was one of the important vehicles that I wanted to see. Not a very intelligent shareholder. The sole purpose of showing the car in Detroit is to SELL CARS in Porsche’s largest market! Yanking it back to Quatar so 3 rich guys can look at it is ridiculous. You’ve now pissed off all those potential car buyers. I hope your shareholders are happy. Because the share price won’t be. You just lost a ton of good will. As a Porsche owner (2), stockholder and HDPE instructor I can only say that my opinion of Porsche has fallen considerably. If in fact the 918 went to Qatar, or wherever, then some executive at Porsche needs to have his employment contract reevaluated. I canceled my trip to Detroit because of this stupid move on Porsche’s part. Having personally enjoyed more than 35 Porsche vehicles over the last 33 years, I consider myself a loyal customer. I have attended the Auto Show nearly every one of the last 30 years, but skipped the recent years due to Porsche’s absence. My plan to attend the NAIAS show tomorrow to celebrate Porsche’s return is subtantially impacted by this news. I would like to hear an official explanation from PCNA regarding this decision. Surely some genius @ Porsche has a compelling business reason to disappoint so many faithful North American customers and faithful supporters. How ’bout it PCNA? The article below published online at the WSJ yesterday. While the RSR going to Qatar is, at this point, still very much a rumor, the info below seems quite conicidental and timely. >>>>DOHA (Zawya Dow Jones)-Qatar Holding LLC will participate in Porsche Automobil Holding SE’s (PAH3.XE) capital increase as part of the planned merger with Volkswagen AG (VOW.XE), a person close to the investment arm of the Arab emirate’s sovereign wealth fund told Dow Jones Newswires Tuesday. “Qatar Holding … will participate in the planned capital raising of Porsche,” the person said. “Qatar Holding considers the merger between Volkswagen and Porsche to be beneficial to all stakeholders and continues to support this initiative,” the person added. Porsche’s holding firm is planning a EUR5 billion capital increase to reduce debt as part of a complex merger with Europe’s largest auto maker by sales. Qatar holds voting stakes of 17% and 10% in Volkswagen and Porsche, respectively, and is poised to emerge as the third anchor shareholder of a combined company along with Porsche’s owner family and the German state of Lower Saxony. Volkswagen Chief Executive Martin Winterkorn said last week the auto maker is “slightly more optimistic” about the prospects and timeframe of the merger with Porsche, after a U.S. court in December dismissed a lawsuit filed by a group of hedge funds over alleged market manipulation. He noted, however, the plaintiffs could still appeal the verdict. counterparts in Germany to make sure we secure the 918 RSR for another U.S.
We have a few other questions that we’ve asked and we’ll write things up in a new post once/if we get additional information. WOW!! Thx to the club for bring this up. Iwas going going to drive 4+hrs from Toronto this weekend only to see it. I think all PCA members should let Germany know what they think!! I was planning on re-arranging a business trip to Detroit just so I could go to the show and see the 918 RSR. I’m glad I didn’t do it. 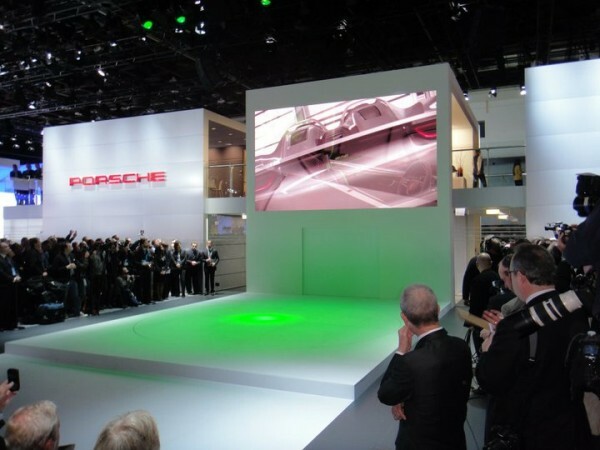 If the 918 RSR was removed from the Detroit Auto Show because a powerful shareholder desided that he wanted it somewhere else at the last minute (and I say at the last minute because if Porsche knew about this in advanced they should have informed the public), I find this action just plain offensive. There is just no other way to describe it. Bad manners Porsche, very bad manners. Porsche shows their colors…..not ‘True Blue’ for all their loyal fans!!! Crybabies…you guys sound like a bunch of sorry sports geeks who get in an uproar when you team looses or moves out of town….grow up! Unless you guys are writing the check and can hop a plane to the mid east…shutup! I like Porsches too. The corp world doesn’t give a crap about you or anyone else….its all about margins….move on and enjoy a real German made vintage Porsche that you might have. Besides, half the parts on the new cars are made in china anyway.